No Halloween party would be complete without a powerful punch. This Witch’s Elixir is deadly good. 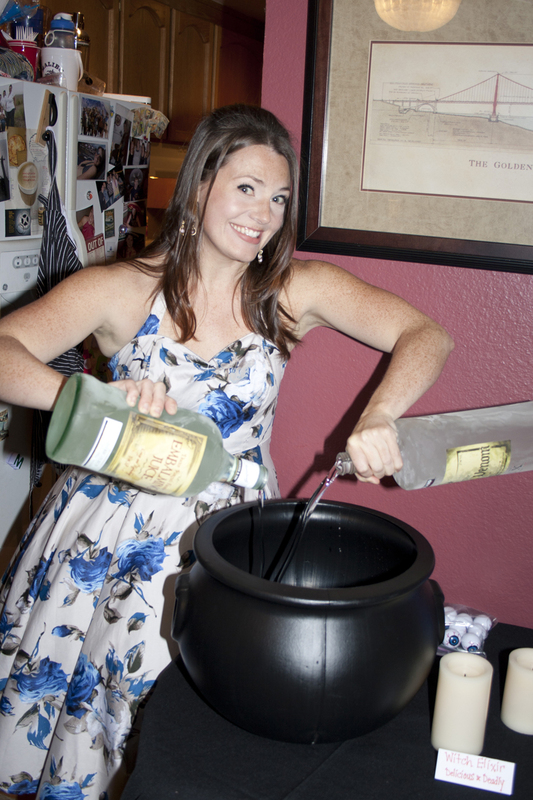 You’ll need a GIANT cauldron or will need to scale down the recipe to fit it in a normal punch bowl. I recommend the cauldron, it really lends to the atmosphere of a good Halloween party. At every shindig I’ve ever made it for, the entire batch of this punch has disappeared. So I’m wondering what brand of liquors did you use to get the best punch! and what color is the final product!? I use Costco’s Kirkland Vodka, Bacardi and Malibu. The final product is an orangey/yellow color. You could really use whatever brand of alcohol you generally drink in mixed beverages. It’s a punch, so doesn’t have to be anything fancy for the liquor. Thank you!..I know sometimes brand and quality can make a big difference when doing a recipe. I will positively be making this for my Halloween party!, thanks again, Happy Hauntings! The clear or spiced rum? Clear rum, but spiced would work as well I’m sure. Are you using a golden color spiced rum or clear rum? Do you have any idea how many people this will serve? Thanks sounds yummy! I have only ever made this punch for large parties. I’d say 30+ people for an entire night of partying. Excellent that’s what I need a LARGE batch for around 40-50 people. Thanks I will be making this in my cauldron on the 29 th!! One last question How big is your Cauldron? Will all this fit in a 16 in diameter cauldron? Thanks!! Yes – a 16 inch cauldron is what I have and it fits great! Have an amazing party! Thanks so much!! I am looking forward to it! You have been a big help!! Cant wait to try this!! I gave the recipe to the gal at Woodmans also. She was curious at my liquior purchases so i gave her your recipe! Thanks again!! Well I made your punch for my party Sat and it was a HUGE HIT! DELICIOUS!!! I will def be making this again. Everyone loved it being served in the big cauldron. Thanks so much for sharing the recipe!!! I’m glad it was a hit Kim! Bet you had a great party!